Gloves for class 100 (ISO 5) applications. 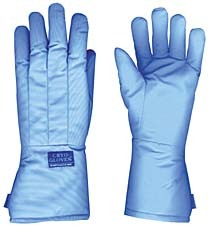 These thin wall nitrile gloves answer the demanding needs of critical environments found in cleanrooms, microelectronics and laboratory areas. The gloves are hypoallergenic, powder-free and manufactured without the use of plasticizers, silicone or powders. Manufacturing engineers will find that these gloves have consistently low particulates. Not only that, but the gloves are inherently anti-static and feature superior snag and puncture resistance, excellent flexibility and tactile sensitivity while affording protection against a broad range of common chemicals. 5 mil (0.13mm) thickness, powder-free, non-sterile, 9" or 12" length, ambidextrous, textured palm and fingers, beaded cuffs. 100/bag, 10 bags/case. Ultra-soft, next generation nitrile formulation provides the relaxed, comfortable fit and feel that you would expect from a latex glove. The strong, high quality nitrile offers reliable barrier protection against many hazardous and infectious substances. Inexpensive and disposable, use to avoid cross contamination. Textured fingers provide an outstanding grip in wet and dry environments. A superior value, ambidextrous, synthetic glove that has a beaded cuff and is powder-free. 100 gloves per dispenser box. Enlargement shows the finely textured finger tips for better grip. Available in blue, indigo or black. 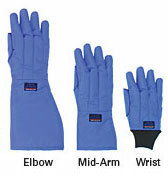 Same as High Sensitivity gloves above but with extended cuff, offering better protection of wrist and forearm. Powder-free. 100 gloves per dispenser box. Ideal for handling delicate sensitive parts, films, electronic instruments, circuit boards and components. Used in assembly and repair work in electronics, telecommunications, precision instrumentation and optics. Add to that film processing, video film handling, electrostatic painting and in the petrochemical industry. Fingerprints and scratches are eliminated on products when this anti-static glove is used. This anti-static glove style is ultra thin, lightweight and is close fit even though one glove fits nearly all and is fine for ambidextrous use. although the glove contains no carbon, it has a new patented continuous filament conductive fiber. 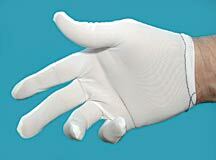 Due to flexibility of this glove, the universal size fits medium to XL. Available in pairs and packs of 5 pair. The polyurethane coating increases grip and abrasion resistance and helps to eliminate finger fatigue. The open-weave design on the back of the hand and fingers keeps your hands cool and allows freedom of movement. The seamless, 100% nylon material is perfect for precise or delicate operations. Handle small parts and samples without fingerprint contamination. Made of natural latex, molded and double-dipped for high elasticity with a smooth, comfortable fit. Gloves have a protective beaded cuff and fit either hand. Non-sterile. Powder-free. Black, chemical resistant nitrile gloves with textured fingertips. Designed for applications in laboratory, automotive, assembly, electronics, law enforcements, security environments where white nitrile gloves would get stained quickly. 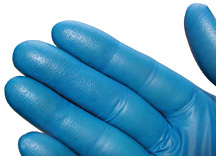 These gloves have excellent ESD properties and are ideally suited for handling static sensitive items and components. Accelerator and powder-free, non-sterile, ambidextrous. 50 gloves per pack. Static Dissipative: 2.2x1011Ω. Test method - ANSI/ESD SP 15.1-2005 ESD standard practice for in-use resistance testing of gloves and finger cots. Quality vinyl gloves with a relaxed fit. These gloves have a protective beaded cuff and fit either hand. Non-sterile. 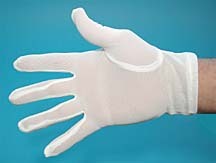 "Regular" style, tricot fabric, lint-free nylon gloves. Re-usable soft gloves to avoid fingerprints and to eliminate scratches. Suitable for clean-room environments and microscopy applications. 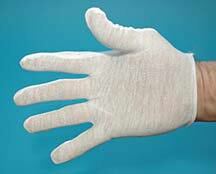 This longer, lint-free nylon glove offers extra comfort, covering the wrist. Tricot fabric. 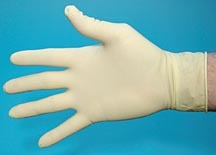 This High Risk Latex Glove is ideal for applications requiring more than the traditional 5 mil (0.13mm) glove thickness. The strong, powder-free, high risk gloves have a thickness of 14 mil which delivers added protection against glove snags, punctures and tears when handling sharp objects. The textured palms and fingers ensure a secure wet/dry grip. The stronger 14 mil (0.36mm) thickness still provides good sensitivity and a fully flexible glove. The non-slip beaded cuff resists roll-down and allows for easy donning. Length is 12" (305mm), thickness 14 mil (0.36mm). Applications are heavy duty lab work, cleaning, forensics, law enforcement. Ambidextrous. Seamless, heavy duty, 30 mil (0.76mm) black neoprene gloves for protecting hands against chemicals such as acids, alkalis, solvents and detergents. Flock lined for greater comfort, perspiration absorption, and easy removal. Textured palm and finger area for improved grip. They are hand specific and are sold in packages of 12 pairs. Length is 13" (330mm). Protection against cryogenic spills and splashes. Used in cryogenic atmosphere, ultra low temperature freezers, dry ice, steam autoclaves and ovens. Suitable for temperatures from -160°C (-250°F) to +148°C (300°F). Note: Not for immersion in liquid nitrogen, use near an open flame or hazardous areas where ignitions could occur. Provides a high-level of thermal protection to the torso and upper legs in harsh cryogenic atmospheres. Aprons have no pockets. For added safety they have quick release buckles at the neck and waist. The material used for the cryo-gloves and cryo-aprons is of a multi-layered insulated construction to provide maximum protection, comfort, and dexterity. A high performance inner lining wicks moisture away from hands to maintain comfort over longer periods. The products are washable with a gentle cycle and air drying. The cryo-gloves can be cleaned to a class 1000 clean room rating if they are cleaned in a class 10 clean room laundering facility. The cryo-gloves can be autoclaved, but a 4% shrinkage can be expected. Not antistatic. Antistatic protection should be worn while handling free-flowing liquid oxygen. 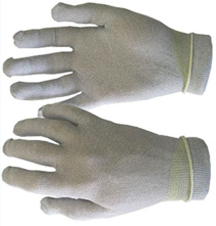 Soft, pliant, all-cotton terry cloth Clavies® Gloves are excellent for handling hot objects out of the autoclave or oven. They are also excellent for use where other heat protection is needed whether in the lab, school or industry. Heat resistant up to 232°C (450°F), they replace hazardous asbestos gloves. Gauntlets in two lengths provide wrist and forearm protection and the bright orange color offers high visibility. Machine wash, tumble dry.